A schematic diagram of the ultrastructure of an Artemia cyst is given in Fig. 4.2.1. · alveolar layer: a hard layer consisting of lipoproteins impregnated with chitin and haematin; the haematin concentration determines the color of the shell, i.e. from pale to dark brown. Its main function is to provide protection for the embryo against mechanical disruption and UV radiation. This layer can be completely removed (dissolved) by oxidation treatment with hypochlorite (= cyst decapsulation, see 4.2.3.). · outer cuticular membrane: protects the embryo from penetration by molecules larger than the CO2 molecule (= multilayer membrane with very special filter function; acts as a permeability barrier). · embryonic cuticle: a transparent and highly elastic layer separated from the embryo by the inner cuticular membrane (develops into the hatching membrane during hatching incubation). The embryo is an undifferentiated gastrula which is ametabolic at water levels below 10%; it can be stored for long periods without losing its viability. The viability is affected when water levels are higher than 10% (start of metabolic activity) and when cysts are exposed to oxygen; i.e. in the presence of oxygen cosmic radiation results in the formation of free radicals which destroy specific enzymatic systems in the ametabolic Artemia cysts. The development of an Artemia cyst from incubation in the hatching medium till nauplius release is shown in Fig. 4.2.2. Figure 4.2.2. Development of an Artemia cyst from incubation in seawater until nauplius release. When incubated in seawater the biconcave cyst swells up and becomes spherical within 1 to 2 h. After 12 to 20 h hydration, the cyst shell (including the outer cuticular membrane) bursts (= breaking stage) and the embryo surrounded by the hatching membrane becomes visible. 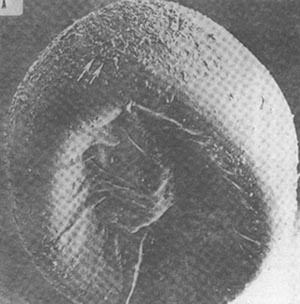 The embryo then leaves the shell completely and hangs underneath the empty shell (the hatching membrane may still be attached to the shell). Through the transparent hatching membrane one can follow the differentiation of the pre-nauplius into the instar I nauplius which starts to move its appendages. Shortly thereafter the hatching membrane breaks open (= hatching) and the free-swimming larva (head first) is born. Dry cysts are very hygroscopic and take up water at a fast rate i.e. within the first hours the volume of the hydrated embryo increases to a maximum of 140% water content; Fig. 4.2.3. However, the active metabolism starts from a 60% water content onwards, provided environmental conditions are favourable (see further). The aerobic metabolism in the cyst embryo assures the conversion of the carbohydrate reserve trehalose into glycogen (as an energy source) and glycerol. Figure 4.2.3. Cellular metabolism in Artemia cysts in function of hydration level. Increased levels of the latter hygroscopic compound result in further water uptake by the embryo. Consequently, the osmotic pressure inside the outer cuticular membrane builds up continuously until a critical level is reached, which results in the breaking of the cyst envelope, at which moment all the glycerol produced is released in the hatching medium. In other words the metabolism in Artemia cysts prior to the breaking is a trehalose-glycerol hyperosmotic regulatory system. This means that as salinity levels in the incubation medium increase, higher concentrations of glycerol need to be built up in order to reach the critical difference in osmotic pressure which will result in the shell bursting, and less energy reserves will thus be left in the nauplius. After breaking the embryo is in direct contact with the external medium through the hatching membrane. An efficient ionic osmoregulatory system is now in effect, which can cope with a big range of salinities, and the embryo differentiates into a moving nauplius larva. A hatching enzyme, secreted in the head region of the nauplius, weakens the hatching membrane and enables the nauplius to liberate itself into the hatching medium. Dry cysts (water content from 2 to 5%; see worksheet 4.2.1. for determination of water content and Table 4.2.6. for practical example) are very resistent to extreme temperatures; hatching viability not being affected in the temperature range -273°C to +60°C and above 60°C and up to 90°C only short exposures being tolerated. Hydrated cysts have far more specific tolerances with mortalities occurring below -18°C and above +40°C; a reversible interruption of the metabolism (= viability not affected) occurring between -18°C and +4°C and between ± 33°C and ± 40°C, with the upper and lower temperature limits vary slightly from strain to strain. The active cyst metabolism is situated between +4°C and ±33°C; the hatching percentage remains constant but the nauplii hatch earlier as the temperature is higher. As for other environmental conditions, optimal hatching outputs are reached in the pH range 8-8.5. As a consequence, the addition of NaHCO3, up to 2 g.l-1, to artificial or diluted seawater or to dense suspensions of cysts results in improved hatching. This might be related to the optimal pH activity range for the hatching enzyme. An increased hatching has been reported with increasing oxygen level in the range 0.6 and 2 ppm, and maximal hatching obtained above this concentration. To avoid oxygen gradients during hatching it is obvious that a good homogeneous mixing of the cysts in the incubation medium is required. As stated above, hatching in a higher salinity medium will consume more of the energy reserves of the embryo. Above a threshold salinity (varying from strain to strain, ±90 g.l-1 for most strains) insufficient quantities of water can be taken up to support the embryos metabolism. Optimal salinity for hatching is equally strain-specific, but generally situated in the range 15-70 g.l-1. Although the physiological role of light during the hatching process is poorly understood, brine shrimp cysts, when hydrated and in aerobic conditions, need a minimal light triggering for the onset of the hatching process, related to light intensity and/or exposure time. As a result of the metabolic characteristics of hydrated cysts, a number of recommendations can be formulated with regard to their use. When cysts (both decapsulated and non-decapsulated) are stored for a long time, some precautions have to be taken in order to maintain maximal energy content and hatchability. Hatchability of cysts is largely determined by the conditions and techniques applied for harvesting, cleaning, drying and storing of the cyst material. The impact of most of these processes can be related to effects of dehydration or combined dehydration/hydration. For diapausing cysts, these factors may also interfere with the diapause induction/termination process, but for quiescent cysts, uncontrolled dehydration and hydration result in a significant drop of the viability of the embryos. Hatching quality in stored cysts is slowly decreasing when cysts contain water levels from 10 to 35% H2O. This process may however be retarded when the cysts are stored at freezing temperatures. The exact optimal water level within the cyst (around 5%) is not known, although there are indications that a too severe dehydration (down to 1-2%) results in a drop in viability. Water levels in the range 30-65% initiate metabolic activities, eventually reducing the energy contents down to levels insufficient to reach the state of emergence under optimal hatching conditions. A depletion of the energy reserves is furthermore attained when the cysts undergo subsequent dehydration/hydration cycles. Long-term storage of such material may result in a substantial decrease of the hatching outcome. Cysts exposed for too long a period to water levels exceeding 65% will have completed their pre-emergence embryonic development; subsequent dehydration of these cysts will in the worst case result in the killing of the differentiated embryos. Sufficiently dehydrated cysts only keep their viability when stored under vacuum or in nitrogen; the presence of oxygen results in a substantial depletion of the hatching output through the formation of highly detrimental free radicals. Even properly packed cysts should be preferentially kept at low temperatures. However, when frozen, the cysts should be acclimated for one week at room temperature before hatching. As Artemia is an inhabitant of biotopes characterized by unstable environmental conditions, its survival during periods of extreme conditions (i.e. desiccation, extreme temperatures, high salinities) is ensured by the production of dormant embryos. Artemia females can indeed easily switch from live nauplii production (ovoviviparity) to cyst formation (oviparity) as a fast response to fluctuating circumstances. Although the basic mechanisms involved in this switch are not yet fully understood, but sudden fluctuations seem to trigger oviparity (oxygen stress, salinity changes...). The triggering mechanism for the induction of the state of diapause is however not yet known. In principle, Artemia embryos released as cysts in the medium are in diapause and will not resume their development, even under favourable conditions, until they undergo some diapause deactivating environmental process; at this stage, the metabolic standstill is regulated by internal mechanisms and it can not be distinguished from a non-living embryo. Upon the interruption of diapause, cysts enter the stage of quiescence, meaning that metabolic activity can be resumed at the moment they are brought in favorable hatching conditions, eventually resulting in hatching: in this phase the metabolic arrest is uniquely dependent of external factors (Fig. 4.2.4.). As a result, synchronous hatching occurs, resulting in a fast start and consequent development of the population shortly after the re-establishment of favorable environmental conditions. This allows effective colonization in temporal biotopes. For the user of Artemia cysts several techniques have proven successful in terminating diapause. It is important to note here that the sensitivity of Artemia cysts to these techniques shows strain- or even batch-specificity, hence the difficulty to predict the effect on hatching outcome. When working with new or relatively unknown strains, the relative success or failure of certain methods has to be found out empirically. In many cases the removal of cyst water is an efficient way to terminate the state of diapause. This can be achieved by drying the cysts at temperatures not exceeding 35-40°C or by suspending the cysts in a saturated NaCl brine solution (300 g.l-1). As some form of dehydration is part of most processing and/or storage procedures, diapause termination does not require any particular extra manipulation. Nevertheless, with some strains of Artemia cysts the usual cyst processing techniques does not yield a sufficiently high hatching quality, indicating that a more specific diapause deactivation method is necessary. Figure 4.2.4. Schematic diagram explaining the specific terminology used in relation with dormancy of Artemia embryos. · incubation in a hydrogen peroxide (H2O2) solution. In most cases, the sensitivity of the strain (or batch) to this product is difficult to predict, and preliminary tests are needed to provide information about the optimal dose/period to be applied, and about the maximal effect that can be obtained (Table 4.2.2.). Overdosing results in reduced hatching or even complete mortality as a result of the toxicity of the chemical. However, in some cases no effect at all is observed. In general other diapause termination techniques (cyclic dehydration/hydration, decapsulation, other chemicals...) give rather erratic results and/or are not user-friendly. One should, however, keep in mind that the increase in hatching percentage after any procedure might (even partially) be the result of a shift in hatching rate (earlier hatching). A major problem in the early rearing of marine fish and shrimp is the susceptibility of the larvae to microbial infections. It is believed that the live food can be an important source of potentially pathogenic bacteria, which are easily transferred through the food chain to the predator larvae. Vibrio sp. constitute the main bacterial flora in Artemia cyst hatching solutions. Most Vibrio are opportunistic bacteria which can cause disease/mortality outbreaks in larval rearing, especially when fish are stressed or not reared under optimal conditions. As shown on Fig. 4.2.5., Artemia cyst shells may be loaded with bacteria, fungi, and even contaminated with organic impurities; bacterial contamination in the hatching medium can reach numbers of more than 107 CFU.ml-1 (= colony forming units). At high cyst densities and high incubation temperatures during hatching, bacterial development (e.g. on the released glycerol) can be considerable and hatching solutions may become turbid, which may also result in reduced hatching yields. Therefore, if no commercially disinfected cysts are used, it is recommended to apply routinely a disinfection procedure by using hypochlorite (see worksheet 4.2.3.). This treatment, however, may not kill all germs present in the alveolar and cortical layer of the outer shell. Complete sterilization can be achieved through cyst decapsulation, described in the following chapter. Figure 4.2.5. Scanning electron microphotograph of dehydrated Artemia cyst. · Cyst shells are not introduced into the culture tanks. When hatching normal cysts, the complete separation of Artemia nauplii from their shells is not always possible. Unhatched cysts and empty shells can cause deleterious effects in the larval tanks when they are ingested by the predator: they can not be digested and may obstruct the gut. · Nauplii that are hatched out of decapsulated cysts have a higher energy content and individual weight (30-55% depending on strain) than regular instar I nauplii, because they do not spend energy necessary to break out of the shell (Fig. 4.3.4.). In some cases where cysts have a relatively low energy content, the hatchability might be improved by decapsulation, because of the lower energy requirement to break out of a decapsulated cyst (Table 4.2.3.). · Decapsulation results in a disinfection of the cyst material (see 4.2.2.). · Decapsulated cysts can be used as a direct energy-rich food source for fish and shrimp (see 4.2.4.). · For decapsulated cysts, illumination requirements for hatching would be lower. The decapsulation procedure involves the hydration of the cysts (as complete removal of the envelope can only be performed when the cysts are spherical), removal of the brown shell in a hypochlorite solution, and washing and deactivation of the remaining hypochlorite (see worksheets 4.2.4. and 4.2.5.). These decapsulated cysts can be directly hatched into nauplii, or dehydrated in saturated brine and stored for later hatching or for direct feeding. They can be stored for a few days in the refrigerator at 0-4°C without a decrease in hatching. If storage for prolonged periods is needed (weeks or few months), the decapsulated cysts can be transferred into a saturated brine solution. During overnight dehydration (with aeration to maintain a homogeneous suspension) cysts usually release over 80% of their cellular water, and upon interruption of the aeration, the now coffee-bean shaped decapsulated cysts settle out. After harvesting of these cysts on a mesh screen they should be stored cooled in fresh brine. Moreover, since they lose their hatchability when exposed to UV light it is advised to store them protected from direct sunlight. The direct use of Artemia cysts, in its decapsulated form, is much more limited in larviculture of fish and shrimp, compared to the use of Artemia nauplii. Nevertheless, dried decapsulated Artemia cysts have proven to be an appropriate feed for larval rearing of various species like the freshwater catfish (Clarias gariepinus) and carp (Cyprinus carpio), marine shrimp and milkfish larvae. Currently, commercially produced decapsulated cysts are frequently used in Thai shrimp hatcheries from the PL4 stage onwards. The use of decapsulated cysts in larval rearing presents some distinct advantages, both from a practical and nutritional point of view. The daily production of nauplii is labour intensive and requires additional facilities. Furthermore, Artemia cysts of a high hatching quality are often expensive, and decapsulation of non-hatching cysts means valorization of an otherwise inferior product. The cysts have the appearance and the practical advantages of a dry feed and, in contrast to Artemia nauplii (470-550 µm), their small particle size (200-250 µm) is more suitable for small predator stages. If they have been dried before application, they have a high floating capacity, and sink only slowly to the bottom of the culture tank. Leaching of nutritional components (for example, with artificial diets does not occur, since the outer cuticular membrane acts as a barrier for larger molecules). On the other hand, a possible major drawback of decapsulated cysts is their immobility, and thus low visual attractivity for the predator. Moreover, decapsulated cysts dehydrated in brine sink rapidly to the bottom, thus reducing their availability for fish larvae feeding in the water column. Extra aeration or drying is therefore needed to keep these particles better in suspension. However, on the contrary, older penaeid larvae are mainly bottom feeders and so do not encounter this problem. From the nutritional point of view, the gross chemical composition of decapsulated cysts is comparable to freshly-hatched nauplii (Table 4.2.4.). In addition, their individual dry weight and energy content is on the average 30 to 40% higher than for instar I nauplii (see 4.2.3.; Fig. 4.3.4.). For example, for the culture of carp larvae during the first two weeks, the use of decapsulated cysts constitutes a saving of over one third in the amount of Artemia cysts used, compared to the use of live nauplii. Furthermore, some differences are found for specific nutrients/components which may have an effect on their nutritional quality. · Fatty acids: the fatty acid spectrum of cysts and nauplii is nearly identical, although differences can be found in lipid levels, FAME levels, fatty acid composition and energy content of different strains. · Free amino acids: the ratio of free amino acids (FAA) to protein content is generally higher for instar I nauplii, compared to cysts, although large variations may exist from strain to strain. This may have dietary consequences when decapsulated cysts are used, since marine fish larvae use their large pool of free amino acids as an energy substrate during the first days after hatching. · Vitamin C (ascorbic acid) is considered as an essential nutrient during larviculture. It is found as ascorbic acid 2-sulfate (AAS) in cysts of brine shrimp, a very stable form but with low bio-availability. During the hatching process the AAS is hydrolyzed into free ascorbic acid, a more unstable form, but directly available in the nauplii for the predator. Decapsulation of cysts does not lead to ascorbic sulfate hydrolysis. Resorption and biological activity of AAS in the predators tissue is still subject of research, and although several freshwater fish have been grown successfully with decapsulated cysts in the larval phase (see above), one can state that feeding decapsulated cysts to larval fish for a prolonged time might lead to vitamin C deficiency in the case that the predator is lacking the sulfatase enzyme needed to break down AAS. · Carotenoids: the carotenoid pattern, and more specifically the canthaxanthin contents, show qualitative differences between cysts and nauplii. In Artemia cysts the unusual cis-configuration is found, whereas in developing nauplii it is converted into the more stable trans-canthaxanthin. For routine operation, it is most efficient to work in standardized conditions (i.e. heaters with thermostat or climatized room to ensure constant temperature, fixed cyst density) to allow maximal production of a homogeneous instar I population after a fixed incubation time (see worksheet 4.2.6.). Best hatching results are achieved in containers with a conical bottom, aerated from the bottom with air-lines (Fig. 4.3.1.). Cylindrical or square-bottomed tanks will have dead spots in which Artemia cysts and nauplii accumulate and suffer from oxygen depletion. Transparent or translucent containers will facilitate inspection of the hatching suspension, especially when harvesting. As a consequence of specific characteristics, the interactions of the hatching parameters might be slightly different from strain to strain, resulting in variable hatching results. The aeration intensity must be sufficient to maintain oxygen levels above 2 mg.l-1, preferentially 5 mg.l-1. The optimal aeration rate is a function of the tank size and the density of cysts incubated. Excessive foaming can be reduced by disinfection of the cysts prior to hatching incubation and/or by the addition of a few drops of a non-toxic antifoaming agent (e.g. silicone antifoam). The temperature of the seawater is preferentially kept in the range of 25-28°C; below 25°C cysts hatch more slowly and above 33°C the cyst metabolism is irreversibly stopped. However, the effect of more extreme temperatures on the hatching output is largely strain specific. The quantitative effects of the incubation salinity on cyst hatching are in the first place related with the hydration level that can be reached in the cysts. Above a threshold salinity, insufficient quantities of water can be taken up by the cysts; this threshold value varies from strain to strain, but is approximately 85-90 g.l-1 for most Artemia strains. In the second place, the incubation salinity will interfere with the amount of glycerol that needs to be built up to reach the critical osmotic pressure within the outer cuticular membrane of the cysts. The fastest hatching rates will thus be noted at the lowest salinity levels since it will take less time to reach breaking point. Optimal hatching can be obtained in the range 5-35 g.l-1. For reasons of practical convenience natural seawater is mostly used to hatch cysts. However, at 5 g.l-1 salinity however, the nauplii hatch faster, as less glycerol has to be built up. For some sources of cysts hatching the cysts at low salinity results in higher hatching efficiencies, and the nauplii have a higher energy content (Table 4.2.5). The salinity can easily be measured by means of a refractometer or densitometer. Conversion tables for various units of measurement are given in Tables 4.2.9. and 4.2.10. The pH must remain above 8 during the hatching process so as to ensure optimal functioning of the hatching enzyme. If needed, (i.e. when low salinity water is used), the buffer capacity of the water should be increased by adding up to 1 g NaHCO3.l-1. Increased buffer capacities can also become essential when high densities of cysts are hatched (= high CO2 production). Cyst density may also interfere with the other abiotic factors that are essential for hatching, such as pH, oxygen, and illumination. The density may be as high as 5 g.l-1 for small volumes (<20 l) but should be decreased to maximum 2 g.l-1 for larger volumes, so as to minimize the mechanical injury of the nauplii and to avoid suboptimal water conditions. Strong illumination (about 2000 lux at the water surface) is essential, at least during the first hours after complete hydration, in order to trigge/start embryonic development. Although this level of illumination is mostly attained during daytime in transparent tanks that are set up outdoors in the shade, it is advisory to keep the hatching tanks indoors and to provide artificial illumination so as to ensure good standardisation of the hatching process. An acceptable cyst product should contain minimal quantities of impurities, such as sand, cracked shells, feathers, and salt crystals, etc. Hatching synchrony must be high; when incubated in 33 g.l-1 seawater at 25°C, the first nauplii should appear after 12 to 16 h incubation (T0; see further) and the last nauplii should have hatched within 8 h thereafter (T100). When hatching synchrony is low (T100-T0 > 10 h), first-hatched nauplii will have consumed much of their energy reserves by the time that the last nauplii will have hatched and harvesting is completed. Moreover, since the total incubation period exceeds 24 h the aquaculturist will not be able to restock the same hatching containers for the next days harvest, which in turn implies higher infrastructural costs. The hatching efficiency (the number of nauplii hatched per gram of cysts) and hatching percentage (the total percentage of the cysts that actually hatch) often varies considerably between differente commercial batches and obviously account for much of the price differences. In this respect, hatching efficiency may be a better criterion than hatching percentage as it also takes into account the content of impurities (i.e.. empty cyst shells). Hatching values may be as low as 100,000 nauplii.g-1 of commercial cyst product, while premium quality cysts from Great Salt Lake yield 270,000 nauplii per gram of cysts (with an equivalent hatching percentage of >90%); batches of small (=lighter) cysts (e.g. SFB type) may yield even higher numbers of nauplii, (i.e. 320,000 nauplii/g cysts). c) amount of dead/non-viable/abortic embryos, due to improper processing and/or storage. As this criterion can refer to the ready-to-use commercial product, it has very practical implications, since the price of the product can be directly related to its output. T10 = incubation time until appearance of 10% of total hatchable nauplii, etc. (Fig. 4.2.6.). Figure 4.2.6. Hatching rate curves from different cyst batches. Curve A: T10= 17 h, T90 = 23.5 h, Ts = 6.5 h; Curve B: T10 = 28.5 h, T90 = 37.5 h, Ts = 9 h.
Data on the hatching rate allow the calculation of the optimal incubation period so as to harvest nauplii containing the highest energy content (Fig. 4.3.4.). It is important that the T90 is reached within 24 h; if not more hatching tanks will be needed so as to ensure a daily supply of a maximal number of instar I nauplii. A high hatching synchrony ensures a maximal number of instar I nauplii available within a short time span; in case of poor synchrony the same hatching tank needs to be harvested several times in order to avoid a mixed instar I-II-III population when harvesting at T90. = hatching efficiency × individual dry weight of instar I nauplius. The hatching efficiency only accounts for the number of nauplii that are produced, and not for the size of these nauplii (strain dependent); by contrast the hatching output criterion is related to the total amount of food available for the predator per gram of cyst product (cf. calculation of food conversion). Browne, R.A., Sorgeloos, P. and Trotman, C.N.A. (Eds). 1991. Artemia Biology. Boston, USA, CRC Press, 374 pp. Bruggeman, E., Sorgeloos, P. and Vanhaecke, P. 1980. Improvements in the decapsulation technique of Artemia cysts. In: The brine shrimp Artemia. Vol. 3. Ecology, culturing and use in aquaculture. Persoone, G., P. Sorgeloos, O. Roels and E. Jaspers (Eds), Universa Press, Wetteren, Belgium, pp 261-269. Clegg, J.S. and Conte, F.P. 1980. A review of the cellular and developmental biology of Artemia. In: The brine shrimp Artemia. Vol. 2. Physiology, biochemistry, molecular biology. Persoone, G., P. Sorgeloos, O. Roels and E. Jaspers (Eds), Universa Press, Wetteren, Belgium, pp 11-54. Lavens, P. and Sorgeloos, P. 1987. The cryptobiotic state of Artemia cysts, its diapause deactivation and hatching, a review. In: Artemia Research and its Applications, Vol. 3. Sorgeloos, P., D.A. Bengtson, W. Decleir and E. Jaspers (Eds), Universa Press, Wetteren, Belgium, pp 27-63. MacRae, T.H., Bagshaw, J.C. and Warner, A.H. (Eds). 1989. Biochemistry and cell biology of Artemia. Boca Raton, Florida, USA, CRC press, 264 pp. Morris, J.C. and Afzelius, B.A. 1967. The structure of the shell and outer membranes in encysted Artemia salina embryos during cryptobiosis and development. Journal of Ultrastructure Research 20: 244-259. Verreth, J., Storch, V. and Segner, H. 1987. A comparative study on the nutritional quality of decapsulated Artemia cysts, micro-encapsulated egg diets and enriched dry feeds for Clarias gariepinus (Burchell) larvae. Aquaculture, 63: 269-282. Warner, A.H., MacRae, T.H. and Bagshaw J.C. (Eds). 1989. Cell and molecular biology of Artemia development. New York, USA, Plenum Press, 453 pp. · Take three small aluminium foil-cups = T1, T2, T3. · Fill each cup with a cyst sample of approximately 500 mg.
· Determine gross weight (at 0.1 mg accuracy) = G1, G2, G3. · Determine gross waterfree weight (at 0.1 mg accuracy) = G1, G2, G3. · Calculate mean value for the three replicate samples. Table 4.2.6. Practical example of the procedure for estmating the water content of Artemia cysts. * after hibernation, cysts should be acclimated at room temperature for a minimum 1 week before drying or hatching. * incubate cysts for hatching; in case the same container is used for this purpose, rinse very well. · Cysts are ready for hatching incubation. · Hydrate cysts by placing them for 1 h in water (< 100 g.l-1), with aeration, at 25°C. · Collect cysts on a 125 µm mesh sieve, rinse, and transfer to the hypochlorite solution. ¨ seawater to make up the final solution to 14 ml per g of cysts. · Cool the solution to 15-20°C (i.e. by placing the decapsulation container in a bath filled with ice water). Add the hydrated cysts and keep them in suspension (i.e. with an aeration tube) for 5-15 min. Check the temperature regularly, since the reaction is exothermic; never exceed 40°C (if needed add ice to decapsulation solution). Check evolution of decapsulation process regularly under binocular. · When cysts turn grey (with powder bleach) or orange (with liquid bleach), or when microscopic examination shows almost complete dissolution of the cyst shell (= after 3-15 min. ), cysts should be removed from the decapsulation suspension and rinsed with water on a 125 µm screen until no chlorine smell is detected anymore. It is crucial not to leave the embryos in the decapsulation solution longer than strictly necessary, since this will affect their viability. · Deactivate all traces of hypochlorite by dipping the cysts (< 1 min.) either in 0.1 N HCl or in 0.1% Na2S2O3 solution, then rinse again with water. Hypochlorite residues can be detected by putting some decapsulated cysts in a small amount of starch-iodine indicator (= starch, KI, H2SO4 and water). When the reagent turns blue, washing and deactivation has to be continued. · Incubate the cysts for hatching, or store in the refrigerator (0-4°C) for a few days before hatching incubation. For long term storage cysts need to be dehydrated in saturated brine solution (1 g of dry cysts per 10 ml of brine of 300 g NaCl.l-1). The brine has to be renewed after 24h. · Principle: active chlorine will liberate free iodine from KI solution at pH 8 or less. The liberated iodine is titrated with a standard solution using Na2S2O3, with starch as the indicator. * starch indicator solution: mix 5 g starch with a little cold water and grind in a mortar. Pour into 1 l of boiling distilled water, stir, and let settle overnight. Use the clear supernatans. Preserve with 1.25 g salicylic acid. * titrate protected from direct sunlight. Add 0.1 N Na2S2O3 from a buret until the yellow colour of the liberated iodine is almost disappearing. Add 1 ml starch solution and titrate until the blue colour disappears. * 1 ml 0.1 N Na2S2O3 equals 3.54 mg active chlorine. · Incubate exactly 1.6 g of cysts in exactly 800 ml 33 g.l-1 seawater under continuous illumination (2000 lux) at 28°C in a cilindroconical tube (preferentially) or in a graduated cylinder; provide aeration from bottom as to keep all cysts in suspension (aeration not too strong as to prevent foaming); run test in triplicate. · After 24 h incubation take 6 subsamples of 250 µl out of each cone. · Pipet each subsample into a small vial and fixate nauplii by adding a few drops of lugol solution. · Per cone (i = 6 subsamples), count nauplii (ni) under a dissection microscope and calculate the mean value (N), count umbrellas (ui) and calculate mean value (U). · Decapsulate unhatched cysts and dissolve empty cyst shells by adding one drop of NaOH solution (40g.100 ml-1 distilled water) and 5 drops of domestic bleach solution (5.25% NaOCl) to each vial. · Per cone (i = 6), count unhatched (orange colored) embryos (ei) and calculate mean value (E). · Eventually leave hatching tubes for another 24 h, take subsamples again and calculate H% and HE for 48 h incubation. · Hatching rate (HR): start taking subsamples and calculating HE from 12 h incubation in seawater onwards (follow procedure above). Continue sampling/counting procedures until mean value for HE remains constant for 3 consecutive hours. The mean values per hour are then expressed as percentage of this maximal HE. A hatching curve can be plotted and T10, T90 etc. Extrapolated from the graph. A simplified procedure consists in sampletaking e.g. every 3 or more hours. Table 4.2.7. Practical example H% and HE. Table 4.2.8. Practical example HR.